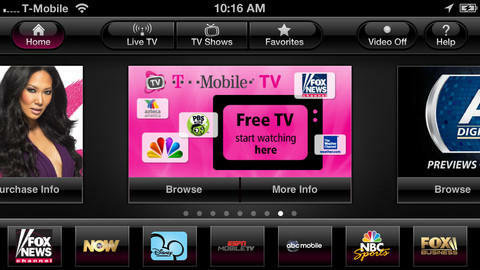 T-Mobile’s streaming TV application is now available for the iPhone 4, iPhone 4S and the iPhone 5 providing the phone runs iOS 6 or newer. The carrier typically offers the service on its other handsets, such as Android devices, but until now it hasn’t been available for the iPhone. T-Mobile TV Prime costs $12.99 for 30 days and provides on-demand content as well as live coverage from ESPN Mobile TV, NBC Sports, CBS Sports, Disney, Nickelodeon, Discovery, Animal Planet, ABC News Now, Bloomberg, Fox News, Fox Business, ABC, Fox, FOX, NBC, ABC Family, MTV, Spike TV, Comedy Central, E! and VH1. 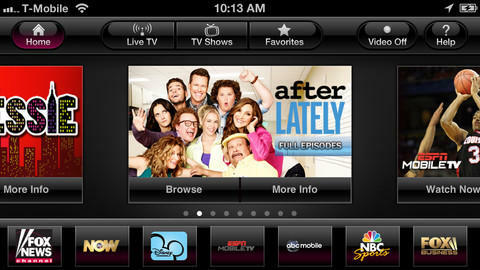 A spanish version is also available for $9.99 per month, but offers fewer channels. There’s also a kid-friendly model for $5.99 per month, a Life & Style package for $7.99 per month, an Urban package for $5.99 per month and a movie channel selection for $6.99 per month. TR-Mobile TV comes with a free 30 day trial, however, so you can give it a whirl before you decide to slap on another monthly fee.